Fremantle Prison and The Perth Mint will appeal to history buffs. Do your shopping at Fremantle Markets and Talijancich Wines. Explore the numerous day-trip ideas around Perth: Caversham Wildlife Park (in Whiteman), Warnbro Beach (in Warnbro) and Mandurah Cruises (in Mandurah). 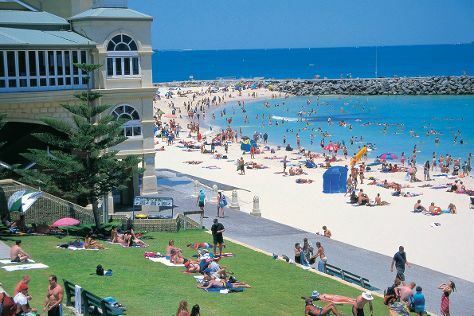 The adventure continues: stroll through Cottesloe Beach, enjoy the sand and surf at Scarborough Beach, admire the natural beauty at Kings Park & Botanic Garden, and contemplate the waterfront views at Swan River. To find photos, maps, and other tourist information, use the Perth trip itinerary website . If you are flying in from Singapore, the closest major airport is Perth International Airport. Expect a daytime high around 38°C in February, and nighttime lows around 20°C. Wrap up your sightseeing on the 9th (Sat) early enough to travel back home.